Have you ever caught yourself wondering where you should go camping next? Have you thought it might be nice to make a change to your tired backpacking recipes? Maybe you found the best place to hike and have some good suggestions to make that hike a better experience. If you have these ideas in your head but you don’t know where to share it, then Vulcan Wiki is for you. The Vulcan Wiki was designed as a resource for scouts and leaders throughout the Vulcan District and Greater Alabama Council. You will find camp recipes, camping locations, hikes and high adventure options. There are listings of organizations that welcome Eagle projects and programs from Scouts Own Services to help you develop your own. Why is it called Vulcan Wiki? Wiki means “a website that allows collaborative editing of its content and structure by its users.” It’s how Wikipedia got it’s name. Our Wiki was developed to let you, the experts, be able to add your own recommendations. You can also comment and rate other entries. 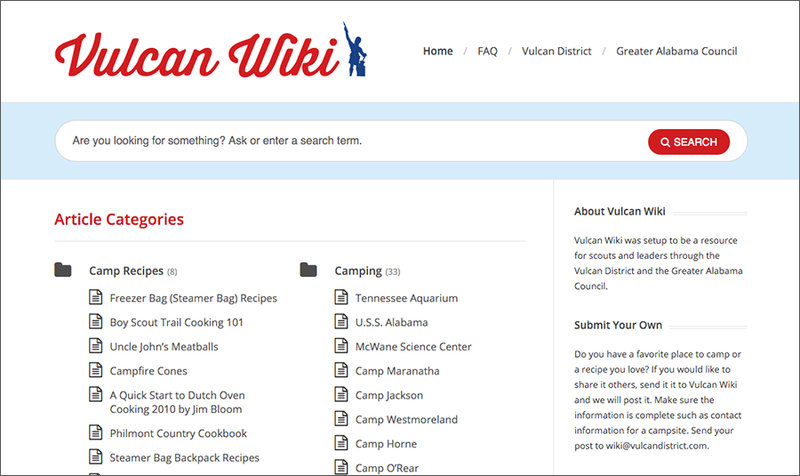 If you have a favorite place to camp or a recipe you would like to share with others, send it it to Vulcan Wiki and we will post it. Make sure the information is complete such as contact information for a campsite. A photo would be great if you have one. Send your post to wiki@vulcandistrict.com. Spread the word about Vulcan Wiki!